Every culinary tradition that immigrated to the United States became something else once its practitioners settled themselves here. In a sweeping generalization (for many households and communities are certainly exceptions), I’ll declare that some of these immigrant food cultures have lost much in translation: Japanese, Chinese, and Mexican are glaring examples. 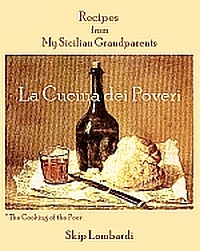 But other culinary cultures have gained: Eastern European, Greek, and Scandinavian cuisines are good examples on the plus side, if only because abundant ingredients and social stability in the U.S. allowed those immigrants to expand their traditions with ingredients they already knew but which were scarce in their homelands. Everywhere, practical cooks will seek substitutions for hard-to-get ingredients. But one thing Indians, Pakistanis, and Bangladeshis in America cannot replace is the culture of domestic help that facilitated much of their cuisines’ complex refinement. Even families of modest means had servants, and until very recently many households were multi-generational and included grandparents, daughters-in-law, aunts, and cousins. Extra mouths, yes, but also extra hands—to roast and grind spices, grate coconuts, and keep fried treats and breads coming hot from the kitchen while the rest of family sat down to a meal. Here, immigrants from the Subcontinent have assimilated while maintaining many of their traditions. But the B4 visa software bachelors of Silicon Valley and the first and second generation Indians who typify many of the South Asians in the US today are just like so many other Americans: too busy to cook or ignorant of the techniques needed to create a meal from scratch. Enter Monica Bhide, corporate-consultant-turned stay-at-home-mom who loves to share food. She has practical considerations: two kids, a husband in a high-powered job, and the usual demands of a suburban American—and no visible servants. She’s a tireless and generous commentator, journalist, and talk-show guest who seems to have something of a financial cushion. And that’s particularly significant, for she is unabashed when she specifies jumbo shrimp, tiny lamb chops, lump crabmeat, basmati rice, jarred chutneys, spice mixes, and other prepared ingredients that are relatively expensive here in the US. But if there’s a commodity on which many Americans put a higher value than food-totally-from-scratch, it’s time. Monica’s readers will buy boneless chicken breasts and squid rings to save themselves some prep work. Better they take Monica’s shopping list than many others out there in the popular media. Whether discussions of food are in print or on TV, radio, blogs, or Facebook, one has to ask how much of it is actually ever made, and more significantly, made to be shared. This is not a coffee-table book; every publisher is on a diet these days, and so there are just a few color photos. 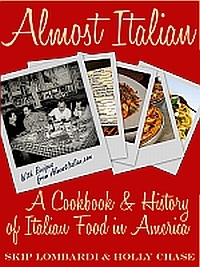 Nonetheless, the recipes themselves and Monica’s essays on food are imaginative and inviting. 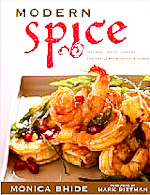 Many who purchase Modern Spice will not follow the straightforward recipes; rather, they’ll use them for inspiration. This book won’t teach you how to cook—but if you can read and follow directions, you’ll be able to party. Should we call her the Desi Devi? Monica writes for her confident and comfortably situated, if not affluent, crowd. If you are reading this blog, you know them: the med-students from Mumbai, geeks from Chennai, and public policy pundits from Poona. Whether they are hip urban professionals in Toronto and Boston or the IT babe in the next cubicle, chances are many of them did not learn to cook—let alone cook like Monica—back in India. But they may have learned here. South Asian or not, anyone who came of age when the Silver Palate cookbooks were on every shelf will understand where Monica’s coming from. She writes for both the Tuesday-night shopper on her way home from the office as well as the weekend bon vivant pouring his neighbors tamarind margaritas while they grill kebabs. Giving her fans a range of brightly seasoned dishes with minimal fuss, Monica will save her readers time. And the subtle message in a not-so-subtle cookbook is that you should spend that time with people you care about. Pick up the book, then pick up the phone. Invite someone to dinner. Stay home to share food you’ve made yourself. * I am using the term “Indian” in the old geographical sense, as in “the Indian Subcontinent” which—before 1947—was simply British India but is now three nation-states: Pakistan, India, and Bangladesh. Each of these sovereign nations has multiple languages, alphabets, creeds, and cuisines within its borders. This stir-fry is great on top of steamed basmati rice. I use a tablespoon of prepared tamarind chutney to add a quick tamarind flavor to this dish. 1. Heat the oil in a medium skillet over high heat. When the oil begins to shimmer, add the shallots and green chiles. Sauté for about 1 minute or until the shallots just begin to change color. 3. Add the chicken and cook 7 to 8 minutes, until the chicken is cooked through. 4. Add the turmeric, chile flakes, and salt to taste and cook for another minute. Add the tamarind chutney and mix until the spice mixture has coated the chicken well. Remove from the heat. Serve hot.